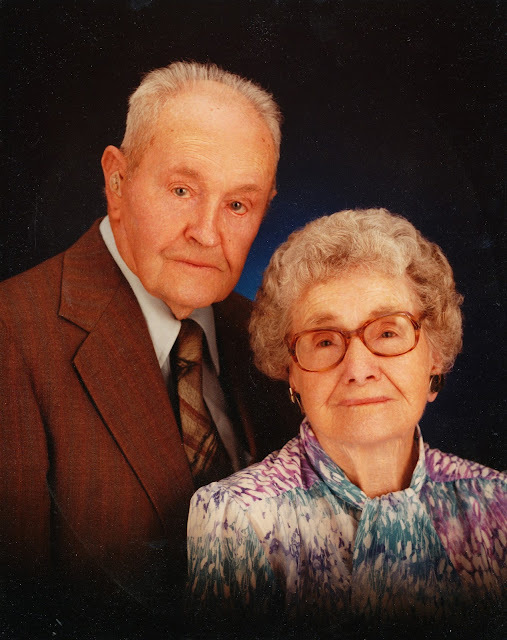 These are my great-grandparents (my dad's mom's parents) and I'm lucky enough to remember them a bit. 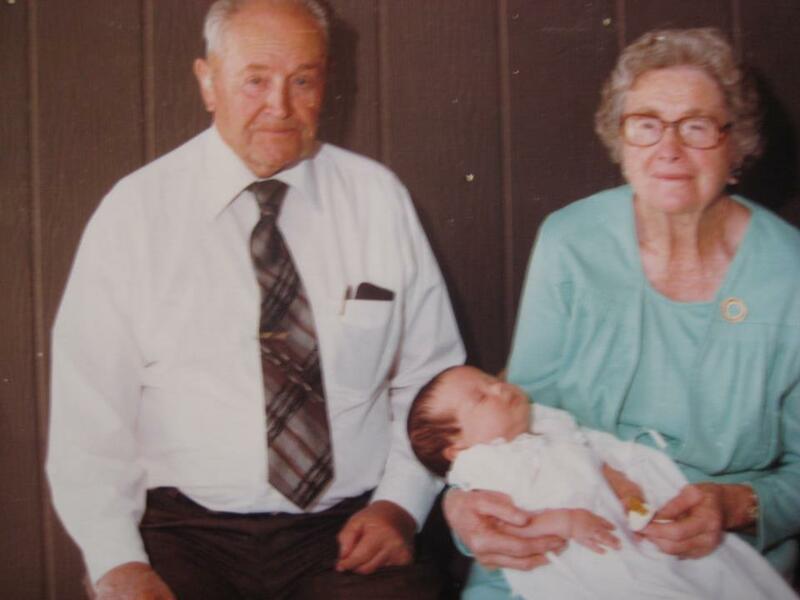 Great-grandpa died when I was about 6, and great-grandma died when I was 15. They raised their family in southeastern AZ. They started a family reunion tradition, which is held (for as long as I can remember), every two years, with each of their 5 kids rotating turns on who plans it. 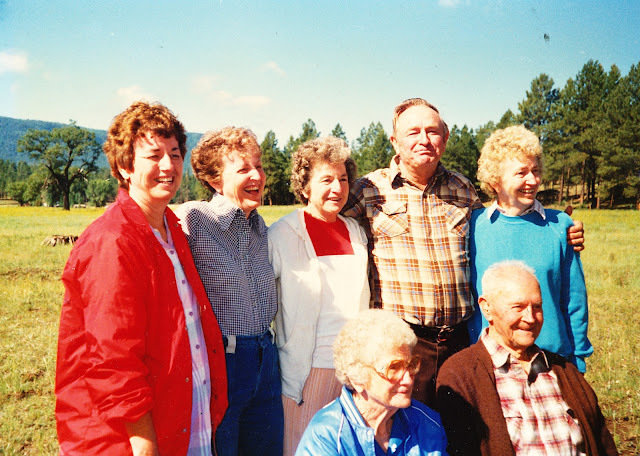 This is from a reunion up in the AZ mountains in the late 80s. My grandma, with all her siblings, is second from the left on the back row. 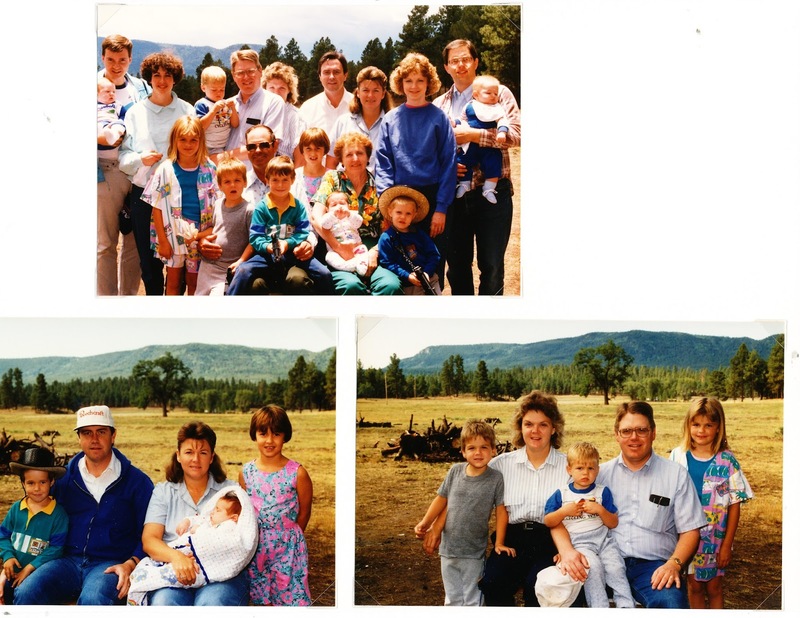 These scanned weird, but here's the rest of my Williams family. The tradition lived on this year, with all of us gathering in southern Utah near Zion National Park. I wasn't able to go the whole time, but Taylor, Courtney, Hallie and I loaded into the car on Friday after work and drove south. We pulled into Ponderosa Ranch right around sunset. We got there just in time for a bonfire and s'mores with the whole gang, then we went back to the Britt's house for some real food. The next morning we hung out around the ranch - it's a great place to have this kind of large gathering. Lots of activities and variety in types of accomodation (basic campground to luxury cabins and in between). Everyone was checking out of their place that day, so we got booted from the rooms a little early and had to figure out where to hang out inside since it was hot. I though I'd be bunking it, but I didn't. Glad I took my air mattress. Free breakfast. It was meh. I slept up in the loft instead. She constantly requests the games on my iPad. Ryan came out of hibernation for once. It was so fun to see my grandma with her sister. They're such good friends and live apart, and don't get to see each other enough. They told some funny stories about growing up and just giggled like little girls the whole time. It was especially touching, since a couple weeks later, my great aunt Corene passed away. My grandma is the only Carpenter sibling left now. I really appreciate this tradition and hope it goes on for years to come, in some way or another. I'm glad for my heritage. I come from good people. And I like that I feel closer to them through these gatherings. The Williams Family Cousins who were there.